History will have it that a certain music shepherd called Winky D commanded his flock to fill Harare International Conference Centre (HICC) and the followers gladly listened. The auditorium was filled to brim with people overflowing and hassling for space. Many ended up sitting on armrests, on stairs and on the ground because all the seats were full. 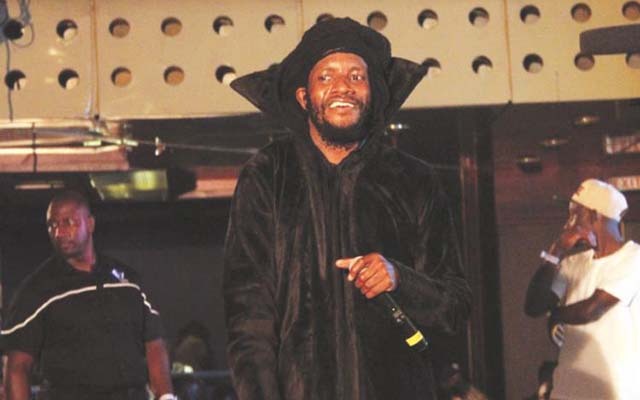 Winky D was dressed like a spirit medium, in all black, clutching a rod in his left hand before changing into an apostolic sect gown for the performance of his duet with Vabati VaJehovah that wowed the crowd. Winky D proved to all and sundry that he is indeed the “bigman”. The performance was just magnificent. His stage antics were amazing. His interaction with the crowd was breathtaking. He oozed energy. The crowd could only sing along as he churned hits. Winky D took revellers down memory lane when he performed songs that he did during his formative years. Songs such as “Controversy”, “Godo” and “Ndiri Rasta” made people reminisce the old days. He fused the old hits with songs from his new album “Gombwe”. However, with such a big crowd in attendance what was going on behind the scenes? A battle of the rich and famous was brewing at the VVIP section. Genius Kadungure who is known for flaunting his wealth on social media wanted to buy the auctioned disc at $20 000 but he was forced to revise the initial amount after flamboyant Albert Ndabambi ‘outshined’ him by bidding the CD for $30 000. Ginimbi, as he is affectionately known in the world of socialites, dug deeper into his pockets forking another $20 000 to make it $40 000. In total, Winky D was promised $70 000, a lump sum that can enable him to buy a house in Harare’s medium density suburbs such as Westlea or Mainway Meadows. Dancehall chanter Kinnah was so incensed by Winky D’s drummer to the extent of nearly manhandling him. The drummer’s crime was to have a sound check during Kinnah’s set. Then came the Buffalo Soldier — after Kinnah incident. Clearly evident was that Buffalo Soldier was struggling to impress the crowd as most of the people did not know his songs. Sensing that revellers were growing impatient and would throw missiles, Kinnah appeared on stage to calm them and the move worked. However, Buffalo Soldier thought Kinnah had overstayed his welcome and chased him off the stage. Backstage there was a singer who was sweating profusely, his name is Nimrod Magaya of Vabati VaJehovah. The group rarely performs in front of such huge crowds. Members of the musical group were visibly tense of what awaited them on stage. However, it was a good day in office for them as they got a standing ovation and applause after rounding off their performance while their duet with Winky D titled “Ngirozi” proved exceptional. At the gate, it seems a number of fans got in for free as they would imposter dancehall musicians. This news crew witnessed a fake Ras Caleb getting free entrance together with four of his ‘band members’. In the midst of the fans, they were thieves too. A lot of people lost their cellphones. Many women complained of being harassed by rowdy males. There were many incidents of serious altercation between men after one passed on silly comments or caressed someone’s girlfriend. However, it was not the case in the VVIP as most of the ladies were trying hard to ‘throw’ themselves to the rich and famous. All in all, it was a show to remember. Musicians came in and gave a blast of performances. Revellers partied till dawn. Ladies wriggled their waist with reckless abandon. Men waved in air in jubilation. Couples kissed and cuddled. Some passed out.